I brought my Takamine guitar along today to attempt to create a similar bridge design. My purpose to have a bridge like the Takamine, rather than the standard Maton style bridge that holds the strings in with removable pins, is because I don’t want to fiddle around with pins while changing strings at gigs. I’d like restringing to be as quick as possible, and I find it quicker on the Takamine than on the Maton. Last session I had to put my bridge creation on hold, as Chris wanted more than a photo to go by, as he’s not done a bridge design like this before. Coincidentally there was a new student, Paul, in class today, who designed a bridge similar to that of the Takamine, and said it had ripped right off the body due to the tension of the strings. Thus, I needed to re-consider the engineering issues of my bridge design. My Takamine has been very a reliable guitar over the last 6 years, and I’ve had no drama with the bridge. 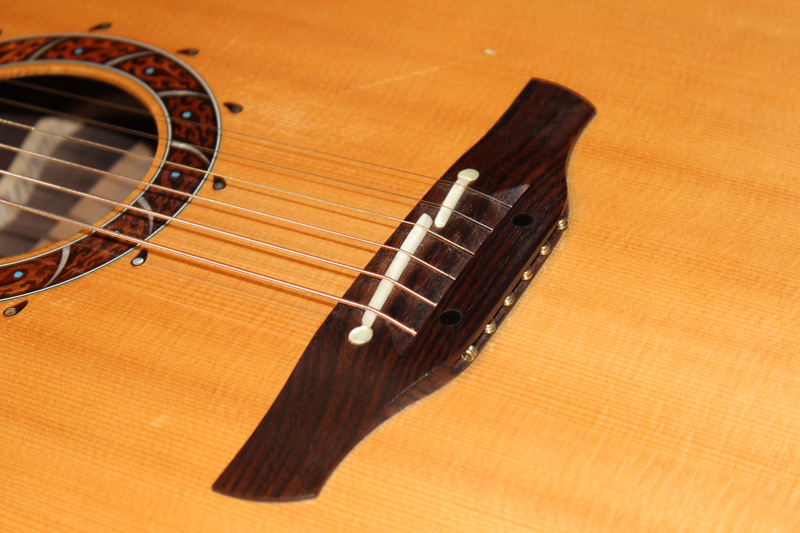 The Takamine bridge has 4 screws, hidden under decorative marks, that hold the bridge on. Paul’s did not. Also, there seems to be a difference with the angle of the 6 string holes that thread through the bridge from the back and out & up the centre of the bridge. Paul drilled his holes upwards from the back of the bridge up to the middle part where it’s carved out. The angle put more tension on the back of the bridge, allowing it to eventually peel up and come off the soundboard after a year of playing. If I kept the 6 string holes perpendicular to the bridge/soundboard, like the Takamine, rather than angled, like Paul’s, there would be less tension on the back of the bridge. If you look at the Maton bridge, the pins are roughly in the centre of the bridge, evenly dispersing the tension from the strings from the centre of the bridge. This means there’s less chance of it peeling away from the soundboard. There was quite a discussion in the workshop today about the engineering of bridges. We’re not sure why the Takamine designed the bridge the way it’s designed, but I’ve decided to follow it for its ease of string change. I may need to screw it in place to reduce its increased risk of coming off the body. Some might say this will “reduce the purity” of the guitar (haha), but if you remember, there’s a strip of masking tape and a truss rod down the centre of the neck, under the fretboard…..
My bridge design is quite similar to the Takamine, although I took some length off the bridge, and left some on the back to hide the ends of the strings a bit more. I’m told that you don’t want a large/heavy bridge as it constricts the movement of the soundboard, consequently inhibiting the projection of sound. I’m hoping reducing the length won’t make it weak under string tension. Part of the feature of the Takamine bridge is that the strings come through the back, and curve up through the centre of the bridge and over the nut. 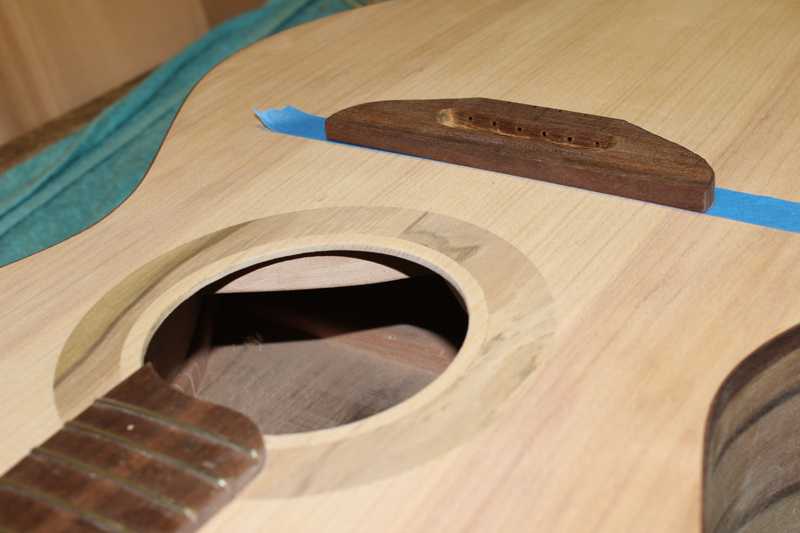 I needed to carve out the area for the strings to come out and up over the nut. 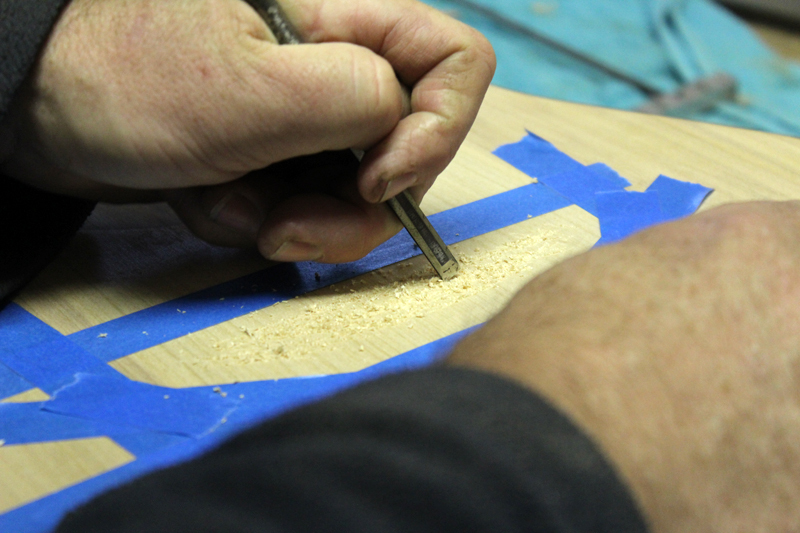 I made it easier for myself, and rather than just carving into the gidgee bridge, I used the router to rout out the majority of the area, creating steps that I would later carve and sand smooth. There was still a lot of fiddling to get the area carved out and looking neat. I spent an hour filing and carving, sanding. Gidgee is a hard wood to work with, one of the hardest. The Takamine bridge is made from rosewood, which is much softer. 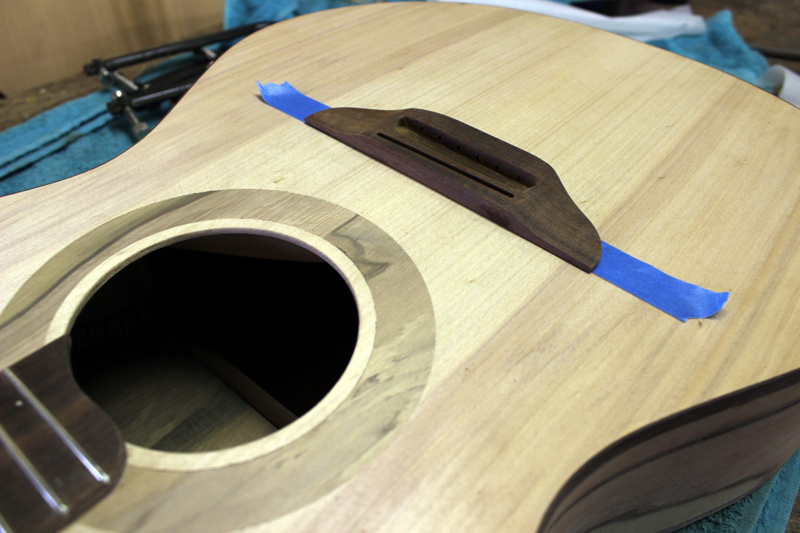 Last session I routed a slot for the strings to enter and hide in at the back of the bridge. 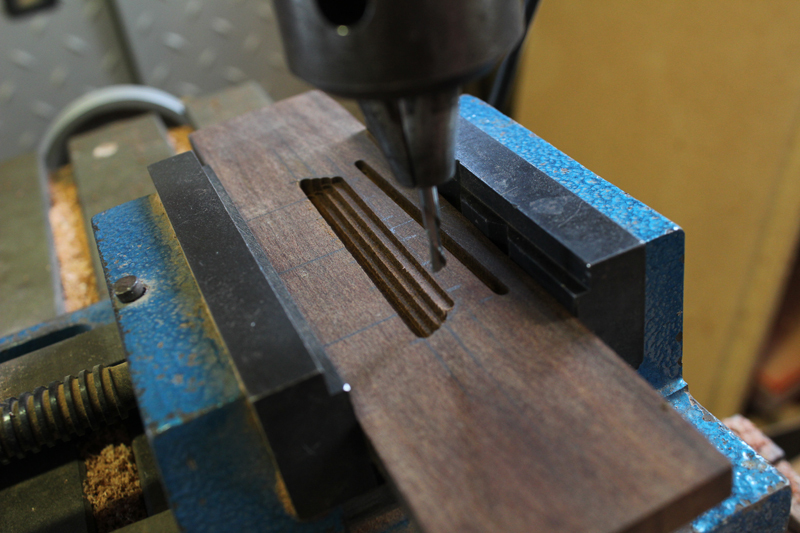 After I’d carved out the centre part of the bridge today, I could then drill 6 holes for the strings to go through from the back to the centre. The distance between these holes is 10.8mm. This was determined by 55mm at 12th fret, minus 1mm, = 54mm divided by 5 to get the string gaps. There was a lot of checking the bridge positioning with a special device, then checking with a ruler and making sure there was enough space for the top and bottom E strings to sit on the fretboard, once lining up with the bridge. After drilling the holes, I cut bridge shape out, and rounded the edges on the belt sander. The shape of the bridge is slightly shorter in length (which hopefully doesn’t jeopardise the surface area for gluing and reduce the ability to hold the string tension), and longer at the back to hide more of the string ends. I carved out the wings of the bridge to get rid of some of the mass, as you don’t want the bridge to be too heavy. I chiselled then neatened it up on the drum sander. The bridge is now looking like a bridge, and is a suitable weight. 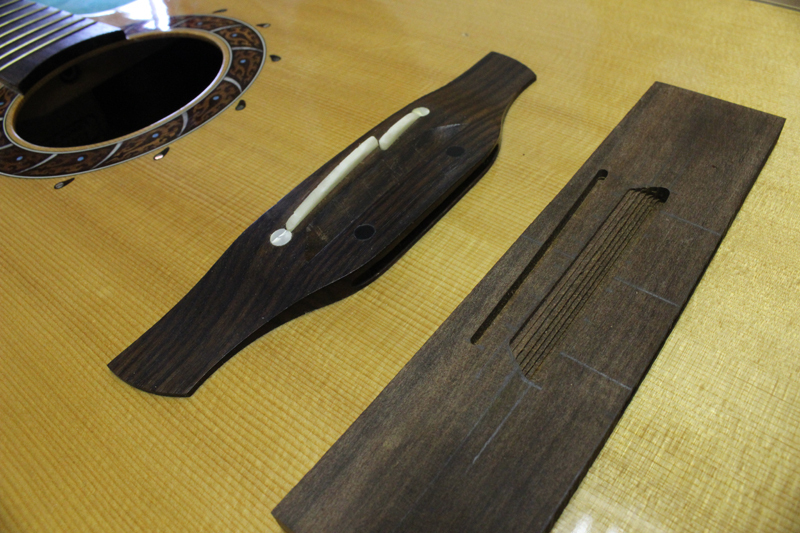 Before attaching the bridge, I needed to make sure the bridge was flush with the soundboard. 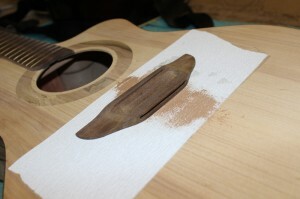 So I stuck a piece of sand paper to the soundboard and sanded the bridge over the area where it was going to be glued. 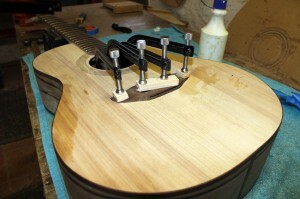 The bridge would be glued to the soundboard (and perhaps screwed later if needed). 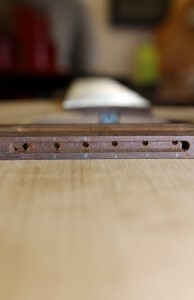 In order to glue the bridge, the exact positioning of the bridge was determined – the distance from the nut to the 12th fret, then the 12thfret to the saddle must be the same. I was horrified when Chris SCRATCHED the soundboard where the bridge would be glued. It felt like abusing the guitar….. scratching up the beautiful wood. I was told to do it to the bottom of the bridge, so I scratched it with a chisel, but accidentally stabbed through the centre of the bridge, where I must have carved it too thin……. AH!!!!!! This will be fine, not too much damage, and once glued, it will not pose an issue, visually or structurally. The scratching is to create friction to enhance the gripping area for the glue. Too small tacks were created by clipping off pieces of nails into the bridge, and this is to stop the bridge shifting when the clamps are applied. I glued and clamped on the bridge! DAY 24 – 10/4/2012 10:30am-5pm.